A selection of match specification in ground socketed football goalposts. Senior 7.32m x 2.44m. Junior 6.4m x 2.13m, Eurogoal, 7v7 and 9v9 sizes. Standard steel or heavy weight tamper proof goalposts for public areas and school grounds. Lightweight alumium socketed parks goal posts designed to be removed from the ground after use. Supplied with ground sleeve sockets to 600mm depth. 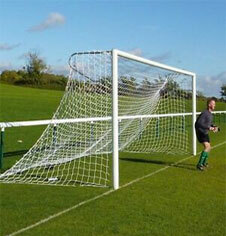 Price is per pair of goals, with a choice of optional polyethylene FPX goal netting. Pair of steel socketed 60mm round standard goals. Pair of steel socketed 76mm round heavy weight goals. Pair of steel socketed 76mm 460mm anti tamper goals. Pair of steel socketed 76mm 600mm anti tamper goals. Pair of aluminium socketed Stadium 3G goalposts. Pair of aluminium socketed 3G Parks goalposts. Pair of aluminium socketed Stadium Pro goalposts. Socketed goalpost elbow and back netting supports.